"...Director Mechelle Moe's production has a lot to like, not the least of which is a stunner of a set from Jeffrey D. Kmiec that constructs an entire sanctuary inside TimeLine's space - which is, of course, a theater inside a church building. It's a beautiful piece of artistry, gorgeously lit by Brandon J. Wardell so that is reveals itself only gradually, morphing from a kind of war-zone hiding place to a place that might offer absolution, if the right kinds of truth and reconciliation occurs within its walls." "...Without spoiling too much about the events of the second act, I found it delivered emotional returns far beyond what I’d expected after a sloggy Act I. The first half of “Cardboard Piano” features a fair amount of repetitive and stilted dialogue and an unearned shock ending, as well as some suspect dramaturgy. (As a gay man not much older than Adiel and Chris, I found myself wondering how they came to such peace with their forbidden love in 1999 while living at the intersection of two deeply disapproving cultures — Evangelical Christianity and post-colonial Uganda — and with few role models available to them.)" "...TimeLine's fathoms-deep dramaturgy (leave time to peruse Jared Bellot's lobby displays) underlines the historical fact that in Uganda, the rise of homophobia and the incursion of Christian missionaries are inarguably connected. Jung offers a sliver of hope amid the brutal damage left in their wake. There's beauty in the ethereal, haunting hymn that closes Cardboard Piano, and perhaps the distant prospect of healing." "...There is one great scene and another that's at least charming in Hansol Jung's play "Cardboard Piano," now occupying the stage at TimeLine Theatre. But all told, this dramatic parable about the intolerance of homosexuality in Uganda limps from adolescent fantasy to a second act that is more contrived than compelling." "...Because Cardboard Piano is more a play of situations than action, some will find these 130 minutes more static than engaging. The final stage picture amounts to an apotheosis within a benediction. But it equally confirms how much of Jung’s drama plays like scattered snapshots from a constant war zone. What some will see as miracles in the making others may dismiss as arbitrary good or bad luck." "...Let's Play 'Highly Recommend' that you check out this powerful play 'Cardboard Piano' at Timeline Theatre, where the church and Christianity can collide; whereas it should be a place of healing, compassion, and kindness instead of hate and intolerance." "...One thing that can always be said about the productions at Timeline Theatre- they are of great importance and in most cases actual and factual! While I look forward with great anticipation to their move to their new building in Uptown, until that time, I will still attend anything they do in their present home located at 615 West Wellington Avenue ( just West of Broadway). I will tell you that during this cold snap in Chicago, you might want to wear a second ( or third) layer, as it was a bit nippy in the theater, but the show is warm and is a story that one can learn from, along with being highly entertained." "...As with many of TimeLine’s productions, you’ll find a brilliant lobby display to supplement the production (in this instance, designed by Dina Spoerl), here including pieces concerning LGBTQ+ activism, spiritualism vs. religion, and the history of the Truth and Reconciliation Commission, providing some hints as to what you’ll be grappling with during what I’d dare to call the first “Must-See” show of 2019." 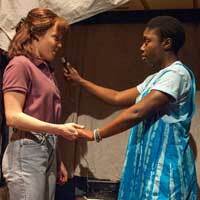 "...Mechelle Moe's staging of this new play by Hansol Jung is dynamic and gritty. She pulls no punches, nor shies away from anger or the passions of Jung's characters. Her production emphasizes the sad irony of how Christians profess to be about love and forgiveness, but often vehemently deny members of the LGBT community this right. Played upon Jeffrey D. Kmiec's stunning scenic design, the audience becomes a fly on the wall, with a closeness seldom achieved in other productions of this acclaimed Humana Festival offering. Great credit goes to Elle Erickson's authentic-looking costumes, Brandon Wardell's heavenly lighting design and, especially, excellent dialect work by Eva Breneman." "...Director Mechelle Moe shows us the passion of both love and hatred in various scenes in this play. In each act, there is a marriage being celebrated: one a wedding night and the other an anniversary. The same actress, Adia Alli, plays both wives and is able to bring the emotion of new love into both her teenage joy and the more mature love of a grown woman. Her characters brim over with their love, and Moe helps her to shape them as completely separate people in a similar emotional situation. The difference, though, is that the young girl can actually believe that all of her problems can be solved by running away and the older woman knows that her job is to remain where she is as a means of support to her troubled husband." "...Jung's riveting dialogue in "Cardboard Piano," born from a unique, informed and international perspective, with the inspired performances of an emerging group of talented actors, will certainly stay with you." "...there are some very strong performances in this production. Jung's Act II gives the characters passionate moments to show their acting chops, and especially Ealy, who is clearly up to the task. Mostly, for this writer, it is Martin's portrayal of a wide-eyed and tortured child soldier in the first act that is totally arresting and for lovers of superb acting well worth putting CARDBOARD PIANO on their calendars." "...Cardboard Piano is a gut-wrenching exploration of what it means to love, to forgive, and to heal. With a story set in a foreign country, one usually known for its poverty and third-world status, this production comes at a necessary time when our own country must reckon with its rejection of its roots and culpability for the world’s trauma."